2019 marks 31 years since the release of Melissa Etheridge‘s smash-hit self-titled debut album. To date she’s released 14 albums, her most commercially successful being 1993’s Yes I Am, which sold more than 6 million copies in the US alone. A household name in the US, Etheridge’s music has largely eluded commercial success here in the UK, even though there is a strong fanbase for her here. It’s a sad fact that her most successful single here is the charity collaboration Just Stand Up! Rather than any of her incredible original material. Coming 3 years after her last record Memphis Rock and Soul, Etheridge is returning to her politically-charged roots for new album The Medicine Show. Never one to hold back in speaking her mind, I’ve been quite interested to see what Etheridge has to say in a world where Donald Trump is the President of the USA. The title track kicks things off and it’s a raucous call-to-arms for Etheridge’s fans. Sounding a little bit like it would have worked in The Greatest Showman, The Medicine Show promises a powerful and grand collection of songs. Things get a little lighter on the more commercially-minded Wild and Lonely about letting loose and getting yourself into trouble. It’s a big shift from the opening number but it’s not an unwelcome one. By track three Shaking, you realise Etheridge isn’t resting on her laurels with this record and she doesn’t want the listener to get complacent either. The tempo is back to uptempo rock and Etheridge’s voice sounds spectacular. The depth and grit in her tone is still jaw-dropping after all these years and Shaking is one of the standouts on the record. In the middle of the record, Etheridge strips back the guitars for the light beat-driven I Know You. The song is a pretty big ballad that showcases a more restrained vocal. I could actually imagine Jennifer Nettles wrapping her huge voice around this one and it could work really well as a duet. It’s a real heart-on-your-sleeve moment and a reminder that Etheridge can really move with her music. When she unleashes the grittier side of her voice in the final two minutes, it’s spine-tingling. Elsewhere on the record This Human Chain has a lazy groove under-pinning it, Love Will Live is a stirringly optimistic moment, and Suede aims squarely for the adult contemporary sweet spot. Here Comes the Pain taps into the wider feeling of disillusionment and divide that’s rife not only in America but across the world right now. The album ends with the heartbreaking Last Hello, a song that explores the impact and aftermath of the school shootings that feel like an everyday occurrence in America these days. ‘No child should see what I have seen, how was I to know that was our last hello’ Etheridge sings and if you’re not welling up with tears, you clearly are missing a heart. 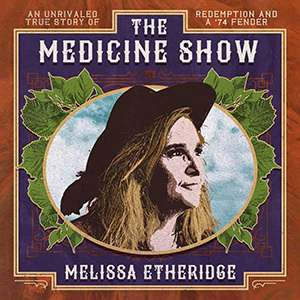 The Medicine Show may be a little bit all over the place thematically but there’s no misunderstanding the things that have been weighing on Etheridge’s mind as she made this record. It’s true to who she’s always been as an artist and it’s an album her fans will love. Whether she manages to convert any new fans remains to be seen but The Medicine Show has all the elements that have made Etheridge a huge star.